Time might not always be on your side, but with the right exercises and a focused approach, you can still get a killer chest session in only 15 minutes. As crazy as it might sound, you can get a great upper-body workout in only 15 minutes if you do the right exercises and use the right approach. The key is circuits, which allow you to handle a lot of volume in a short amount of time. The benefits extend beyond efficiency, however. Circuits challenge your fitness level in a way that traditional straight sets simply can't. They also eliminate the excuse that you don't have enough time to train—because anyone can find 15 minutes to spare! This circuit is designed to keep you close to your incline bench. That way, you don't have to move from one end of the gym to another for each exercise, and you don't have to worry that someone might take your weights. Creating circuits like this that you can do in a small area helps save a ton of time. Your transition between exercises is quick, and others can see you're working in that space so they are less likely to accidentally take your equipment. For this circuit, you'll warm up first, then aim for two full rounds, resting only 1 minute between. Remember, you want as little rest as possible between exercises. So mentally prepare yourself to hustle. If your 15 minutes is not yet up after the second round, you can start a third—but stop if you must when your time is up. There isn't too much to say about the incline press that hasn't been said before. It's your basic, compound pec-punisher, which is precisely why it has a place in this fast-and-furious chest routine. Set the bar up with a weight you can handle for around 10 reps. You don't want to reach failure right out of the gate, but you still want something challenging. If you're dying to do something different, try 1-1/2 reps on your press. To do this, perform a full rep, then lower the bar halfway down and press back up. That's 1 rep. Those half reps might not feel like much at first, but eventually your pecs will be struggling to hold the bar and press it back up. Repeat these 1-1/2 reps for the full set. This exercise may look easy, but don't try to do it with 45s. As a matter of fact, if you're new to the Svend press, start with 2-1/2-pound plates until you feel it working properly. Then work up to 5s and maybe 10s. 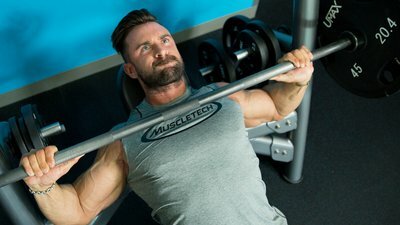 This exercise is really not about the weight at all; it's about squeezing your arms together and contracting the pecs as you press your hands forward. When done correctly, you'll feel this work from the outer pecs all the way into the middle. Your chest won't be the only muscle group working on this exercise; your core is going to have to keep your body stable. But, if you have a strong core and you're up for a total-body chest exercise, this one move will annihilate your pecs. If you have dumbbells that allow the plates to spin, you can use those instead of the barbells. If not, the regular version is probably your best bet. You can also get creative and use a couple of towels on a smooth floor, or Frisbees if you're on carpet. This is a tough exercise but well worth it if you manage to keep the tension on the pecs. If you're in a smaller gym that doesn't have a lot of floor space, go with a suspended fly or place a band around a solid object. Perform a traditional push-up, then rotate your body to the right in a clockwise direction using your hips as the pivot point. Perform another push-up, and rotate again. If you start at what would be the 12 on a clock, the next position would be 1, then 2, and so on until you make your way all the way around and end up facing the same direction as you started. For an added challenge, "hop" your body into position each time. On the second round, go in a counter-clockwise direction, rotating to the left instead of to the right on each repetition.